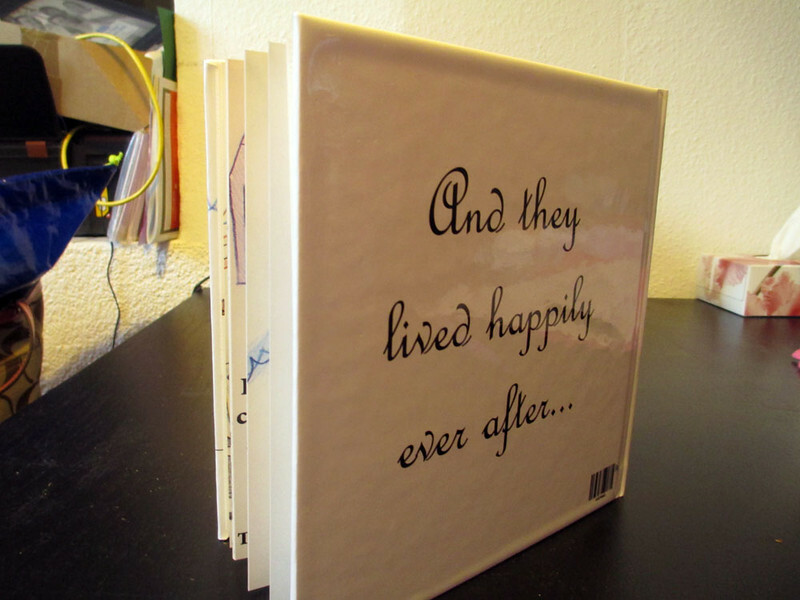 DIY Kids Storybook: Paper Wedding Anniversary Gift Mama Say What?! | Mama Say What?! Traditionally, the first wedding anniversary is the ‘paper’ anniversary – Gifts are ‘paper’ themed. When my husband and I were approaching our first wedding anniversary, I was pregnant with our first baby. I considered a few different gifts, but wanted to be really creative. 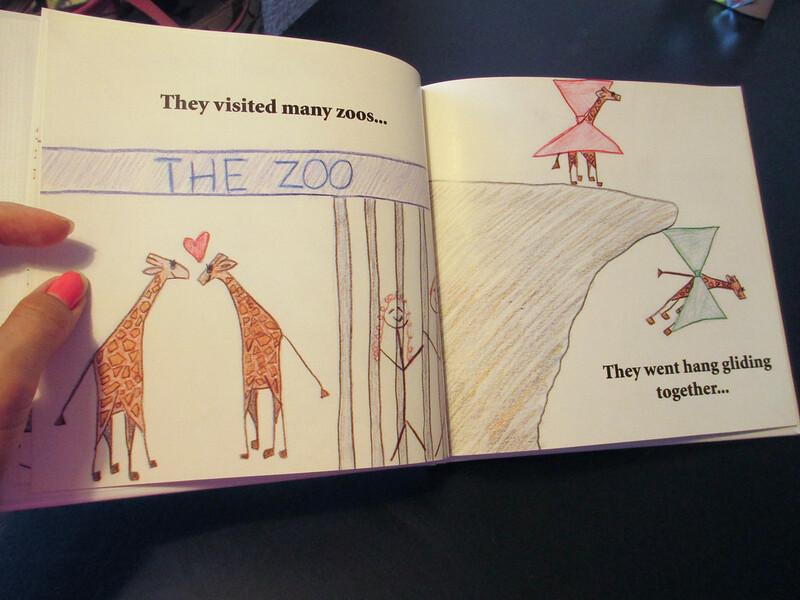 I had this idea to create a children’s book of “our story” to give to him to read to our new baby when she arrived. It took a lot of work and a lot of time, but it was so worth it and really, really cool. 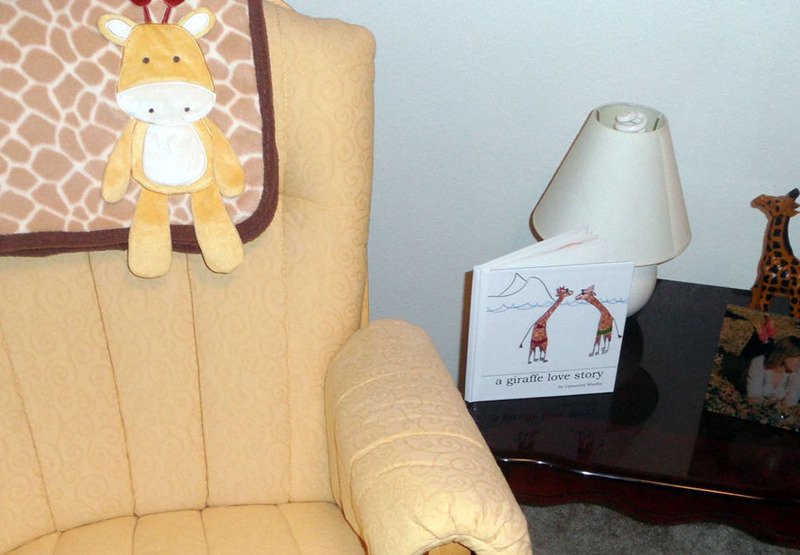 At the time, we were in the process of decorating our new baby’s nursery in a ‘giraffe’ theme. 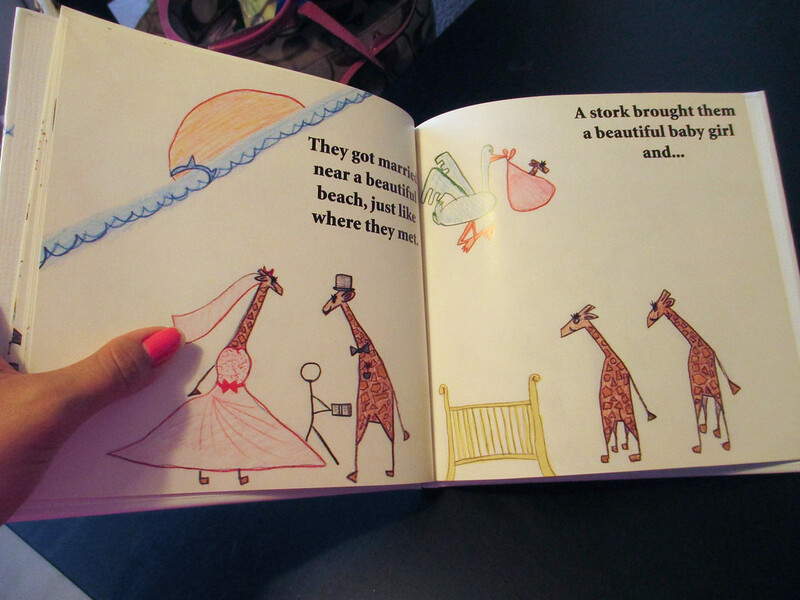 Since this gift was partially a gift to her as well, I made the main characters in the book giraffes. I then wrote out “our story” of how we met, dated, fell in love, and married, and divided it into about 19 separate parts, since the book I wanted would be about 20 pages long. The hardest part was illustrating the book. Let me tell you – I am no artist. I watched (many) video tutorials on YouTube on how to draw giraffes and other things and then went to work with pencil on plain sheets of paper. First I decided what to draw to match the text on each “page” I wanted. Then, using a regular pencil, I drew the illustration. When I was happy with it, I used colored pencils to draw over the lines and color it in. I had many (many!) attempts for each page— this part took more than two months of drawing in my spare time! When I finally finished the illustrations, I scanned them all onto the computer and saved them as image files. Then I went onto Shutterfly.com to create a photobook. I used one illustration per page and added my desired text on top of the photo of my illustration. Voila! It took a little tweaking here and there because I hadn’t drawn the illustrations the correct size, even though I thought I had, but it ended up working out well. I incorporated into the ‘story’ things about us and our relationship. 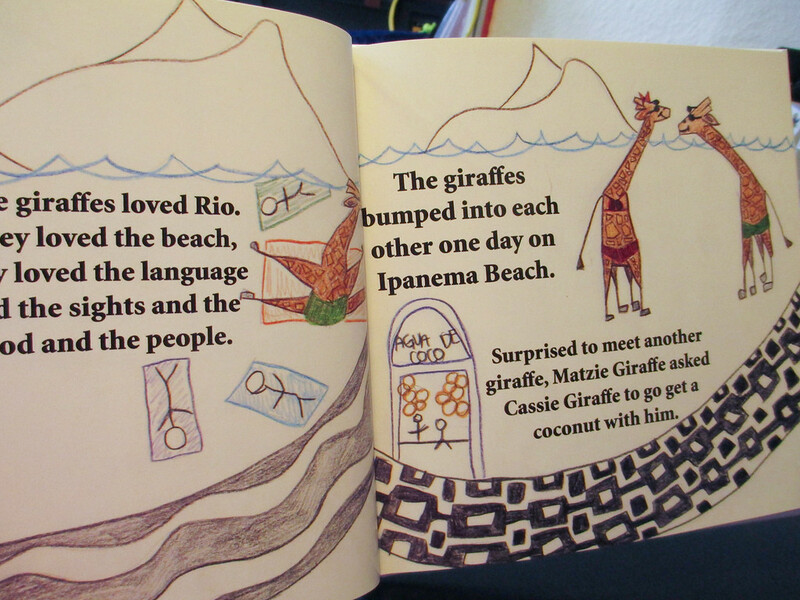 For example, we met in Brazil – I spent a lot of time tediously coloring the infamous black and white patterned streets of Ipanema and Copacabana. We dated long distance — I drew an illustration of the giraffes Skyping with one another. 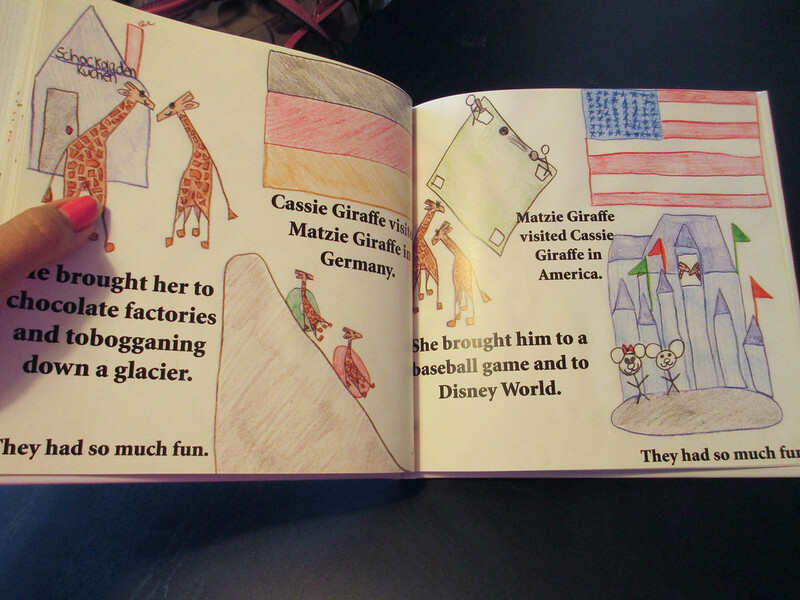 He visited me in the U.S. and I visited him in Germany – I drew the traditional things we did when we visited each other, like going to a baseball game and Disney World in the U.S. and touring chocolate factories and tobogganing down snowy mountains in Germany. The story ended with a stork bringing us a baby girl (and I illustrated the yellow wicker crib we had worked so hard to restore). I used the last page of the book as a “dedication” page and wrote a small note to my husband about reading it every night to our baby girl. I was bursting with excitement in the two weeks I waited for it to come in the mail. Needless to say, my DH was thrilled with it on our first anniversary. When my daughter was little, the book sat displayed in an honored spot on an end table in her room. My DH read it to her often. Now, more than two years later, it sits on her bookshelf amongst all her other books. We don’t read it very often, but every once in a while we take it down and read it. 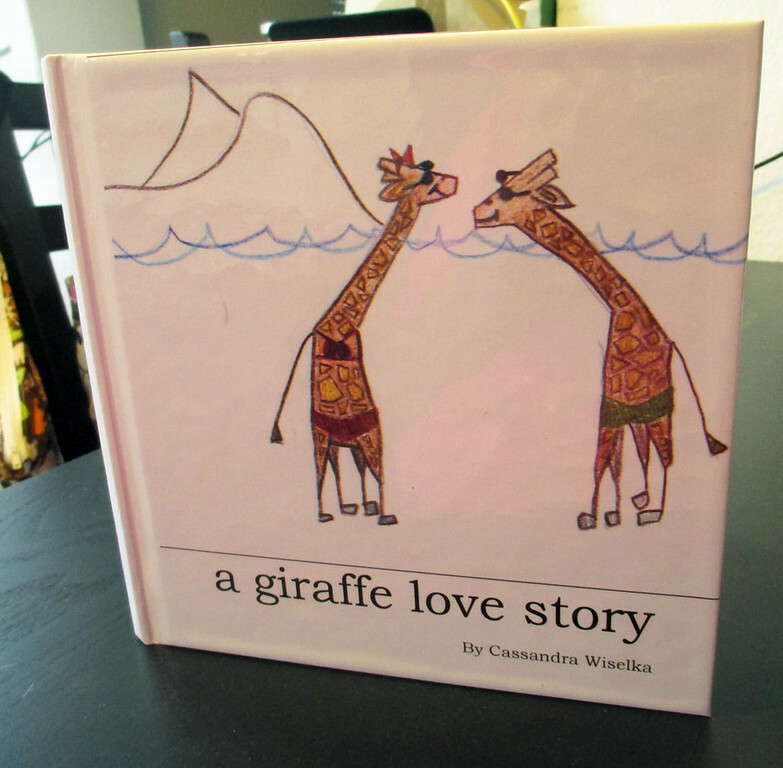 It’s a special part of our childrens’ book collection and even more special to my husband and myself. Added by Cassie W. on August 10, 2013. This is so adorable! Fantastic job Cassie! This is a crazy cute idea!! Thanks for sharing it!